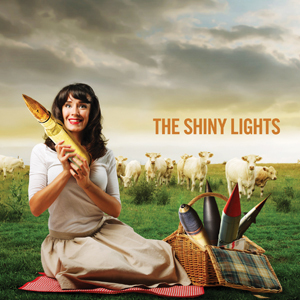 Write your own review of The Shiny Lights CD! Post your review of our new record in the comment section of this post! We will share our favorite reviews on Facebook! I can’t think of a nicer group of people. I have worked closely with John, Noah & Chris and have been in absolute awe of their talents for years. While I don’t know Steve nearly as well, his amazing bass lines floor me & his warmth & humor fit in perfectly. Being an EP, there are 6 GREAT songs. Not a dud here. The production. This record sounds great! It seems blissfully un-hip. These guys seem absolutely comfortable with each other. John playing keys. A lot of people never knew that John was first & foremost an ivory tinkler. Great to hear him on record, FINALLY! Chris’ unflappable penchant for the slightly quirky, but tender pop song. Amazing. Who writes songs like that? John’s guitar & vocals. Scud missile indeed! Noah’s effortless, yet astounding drumming. I wish I had been there to watch, mouth agape. Steve Price’s bass. Is it really that good? (absolutely) Is it really that easy? (NO!) A quiet giant in local music. Also a straight-up good guy. This record reminds me of why I STILL get excited about GOOD new music. I hear shades of everything that these guys hold dear. A little Rundgren, A little Sly, a touch of French folk, some Brian Wilson, Faces, & a whole lotta warm fuzzy SHINY LIGHTS. This EP fits my life & makes me feel good! Gentlemen, it’s a honor to call you my friends. Thanks for the music, warmth & friendship! What the world needs now is alot of Shiny Lights, I love this CD. Its fun quirky feel good stuff. Exactly what we need now..More please. Sorry Dave, did’nt read your review before i did mine,quirky,feel good. But thats how it feels,anyhoo. I can’t help but to agree with everything that Dave and Kam had to say! Quirky feel good brilliance-good stuff gents! So very refreshing..exactly what I expected from Chris and John..always a good combination..Mick loves it too, I’m sure.. I love this album. I work with Chris and got the CD from him. It’s one of those rare albums that every song id good.